There are many benefits to installing a security system in your home. It gives you a sense security and safety for you and your family. You’ll be able to be away from your home for both short and long periods with a peace of mind. The one choice you’ll need to make is the type of security system that you want to be installed in your home. Some alarms are manned by commandoes while others have much more simplistic designs. While some systems are installed by a professional, others are easier to install and can be done with a DIY approach. Remember that you can always start small and install a more complicated system as time goes on. You don’t even need to know how to use a drill or have any kind of technical expertise for most DIY install security systems. Below, you’ll find the basic steps that you should know before you install a home security system. These are the basic things that will come with every home security system no matter how simple or fancy you get in your alarm system selection. The number of sensors that you need will depend on the number of doors and windows that are in your home. It also is based on your own personal preference. Remember that these sensors will be activated every time a door or window is opened when they are installed in your home. Security panels are often wireless and should be placed near a power source to plug the panel in. These should also have a backup battery of some sorts. You can either place a nail on the wall or put an adhesive on the back of the panel. It’s really that simple to put the panel up! Security systems will come with door and window sensors and possibly along with some motion detectors. They will be placed with a moveable adhesive for your convenience. Every security system will come along with instructions for the optimum locations to place these sensors in. Once you have completed the above steps, you’ll need to test your system to ensure that it has been properly activated and that everything is working properly. The specific system that you’re installing should also come along with some instructions for testing purposes. While DIY home security systems seem fairly simple, they aren’t for everyone. Some homeowners prefer more complex systems to suit their needs. If a professional installation is for you, you should avoid self-install security systems altogether. It's a good thing if you feel safe in your neighborhood. It shows that you trust your neighbors and that you have faith in the safety of your family. However, many of us grow so comfortable that we overlook simple security measures that will only improve the safety of your property and your family. Each year in the U.S. there are millions of property crimes carried out. Burglary accounts for a large amount of these crimes. People often say that if a burglar wants to gain entry to your home they'll find a way and determine not to take security measures seriously. If you're of the "it couldn't happen to me" mentality, read no further. But if you want to learn some basic tools and practices that will keep you and your family safer, read on. Not literally. But pretend to be. Go through the exterior of your house and think like a burglar. Check your windows. Especially the low-hanging ones. Are all of your locks secured? Do you make it a point to lock them nightly? Test your locks. Not all locks are created equal. Doorknob locks are often easily picked or forced open. Deadbolts are harder. However, none of these things matter if the integrity of your door is compromised. French doors, for example, are particularly easy to force open. If you're worried about your locks, consult a locksmith that can help you choose better options. Look inside your home from the sidewalk. Are there valuables within view from the street? Do you have a tendency to leave your garage door open, exposing expensive items like lawnmowers, grills, or even motorcycles? Burglars don't just target homes. Don't end your search with the house. Many items are stolen from sheds, backyards, and even off of porches, which happened to me as a child when a bicycle was taken from our porch in the night. Install a fireproof safe in your home. Hope for the best but plan for the worst. Keep your important documents in the safe, and better yet, keep them backed up in a secure file on the cloud like Google Drive or Dropbox. Use motion light detectors. When calibrated correctly they won't go off for every car or cat that happens by and they're a great theft deterrent. Tell your neighbors if you're going out of town, and have someone take in your mail/newspapers for you. Keep a kitchen light on and a car parked in the driveway if possible. Don't leave spare keys under the rug or anywhere obvious. Also, keep tabs on all of the keys to your home. Know who has a copy and check up on the spare keys on occasion. The Security of the home is a point of paramount significance to all homeowners. Burglary is one of the most common crimes committed in the United States. It is estimated that every 15 seconds, someone falls victim to this felony. Knowing that a criminal has violated their personal living space, homeowners can become fearful and feel insecure in their own homes. Worrying about whether or not your home is safe can affect the whole family's feeling of security. Together, the family can make some simple changes that may help deter a felon from entering their home. Helpful hints to secure your home against burglary: Do not leave valuables lying around in plain sight, inside or outside of the house. This could be an open invitation to thieves. Personal belongings that would be tempting to a burglar should be kept out of sight in a secure location. There is a wide variety of home safes available today that provide secure storage. It is also important to protect your belongings outside of the home. Leaving expensive items such as toys, bicycles, or tools unattended in an easily accessible area of your yard is an unsafe practice. The criminal mind is always looking for a quick pick ! Be aware of how much personal information your trash can provide. After purchasing a new appliance or electronic device, avoid placing the box in its entirety out with your trash. Cut it up, place it in a large trash bag, or bring it to a recycling center. To a criminal this is great advertisement that there is an brand new plasma TV in your house! Burglars tend to come around when no one is home. If they get the impression someone is home, it discourages them from entering. Therefore, when leaving the home, it is best to create an illusion that someone is still there. Leave on some music, a lamp by your favorite chair and maybe your coffee cup on the table. When you need to be away from your home for an extended period, the use of timers on the inside and outside lights will improve the authenticity that someone is actually home. The minimal amount of electricity that you will be burning to implement these safety measures will be well worth it if you can deter a break in. Securing all possible entry points of your home is also key. Older sliding doors and windows may need to be secured with an extra measure of protection as some can be easily popped off. Bulkheads and basement doors need to be locked and secured to avoid easy access. Window air conditioning units can be easily removed allowing quick access if not installed securely. An unlocked door on an attached garage can be open invitation to a criminal. Keeping your doors locked may not deter all break ins, but it is a simple step to take in making your home more secure. Although it may seem like a good idea to leave a spare key under the doormat, this type of behavior should be avoided. Most burglars are aware of the common hiding places and will quickly locate your "hidden" key. A safer option is to give a spare key to a trusted neighbor or friend. You can keep a spare key hidden in your vehicle or secured with a combination lock somewhere outside of the home. Remember, never place any information that identifies your house on the key just in case it ever ends up in the wrong hands. There are many things a homeowner can do to keep their home safe. Fortunately there is also a wide variety of home security systems available for individuals that desire a higher level of security. Taking the preventative measures that you can and seeking the guidance of a security system professional is the best way to confirm your home secure. New Home? Time to Change the Locks! If you are a new homeowner and haven't changed your locks yet, then you should strongly consider doing so as soon as possible. You have no way of knowing who holds keys to your new home. Thankfully, there are really cheap ways to go about accomplishing this. Hiring a locksmith to come into your home and change the locks can be expensive, but is an option if you are pressed for time. However, you can take your locks to a local locksmith shop and have them changed for a fraction of the price. If you have different keys for different doors, you can use this as an opportunity to make all of your locks match. Additionally, you can choose to purchase knobs and deadbolts that suit your decorative flair a little more. Sets can be ordered online, or through your local hardware store. Styles like egg-shaped bronze, handle pulls, oil-rubbed bronze, and riverwind doorknobs can add a touch of personality to what can ordinarily be a home fixture easily looked past. 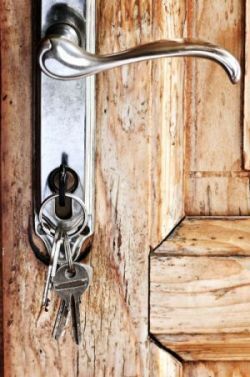 After refitting your home with new locks, be sure to pay attention to the placement of your new keys. Wait until you get to know your neighbors a little better before you leave a spare key with them. Until you become a part of the neighborhood, keep a spare key handy, but hidden. Hideaway rocks, potted plants, and magnets can all be employed as a good hiding place, provided they aren't too conspicuous-looking.